Both exhilarating and wrenching, Hilary T. Smith’s debut novel captures the messy glory of being alive, as seventeen-year-old Kiri Byrd discovers love, loss, chaos, and murder woven into a summer of music, madness, piercing heartbreak, and intoxicating joy. From Goodreads. Trigger Warning: This book features drug use and discussion of murder. Wild Awake by Hilary T. Smith is not the story I expected. From the description above, I thought it was a story that was going to take place over the course of a night. But in fact, it's a story that takes place over weeks, as a girl's mental health slowly declines. And it's absolutely brilliant, unbelievably beautiful, and completely heartbreaking. Kiri's parents have left Kiri alone at home while they've gone away on holiday. She thinks it's going to be a normal summer; practising piano for a showcase she has coming up, and practising in her band with Lukas, her best friend, for Battle of the Bands. But then she gets a phone call that turns everything upside down. Kiri's brilliant older sister, Sukey, who she idolised, died five years ago. She was told she died in a car accident. But she has been lied to. She finds out through Sukey's neighbour, Doug, - who has kept hold of her things for the past five years, but can't keep them any more because the building is being knocked down - that Sukey didn't die in a car accident, she was murdered. The revelation of Sukey's death and the life she had in the lead up to her death, leads to Kiri's mental health slowly declining. I was recommended Wild Awake for it's bipolar rep, but nowhere in the book is bipolar mentioned. And considering that Kiri's story takes place before diagnosis and treatment, it makes sense that it wouldn't be. But, although it's not mentioned anywhere in the review, Disability in Kidlit's review of Wild Awake categorises it as featuring bipolar disorder, and I'm inclined to go with what they know. As I said, this Kiri's story is set before she has been diagnosed and receives treatment, and is instead the story of how her bipolar slowly manifests. It's absolutely heartbreaking watching her deal with discovering the truth of Sukey's death and her life before it. Everything she believed for the past five years is a lie, and now it's like Sukey has died all over again. And it's this grief, heartache and betrayal that she feels, and the shock at discovering someone actually killed her sister, that triggers her bipolar. There's no specific point where she goes from ok to "unhinged". It's not 0 to 60 at the flick of a switch, and she's fine one second and "going crazy" the next. It's a slow process as Kiri's mind gets away from her. And that's what it feels like, like her mind is separate from her, with her thoughts going on and on and on, and she unable to control them. But before she gets to the point where I was worried about her, she didn't seem like she wasn't ok. Because of her narration, even though she would be thinking things that were kind of odd, we could follow her thought processes, and they made sense even if her thoughts were strange. But over time, her thoughts and behaviour get more out of control. And I did worry, because as you get to know her, you can't help but love her. She's funny and she's spunky. Before she started getting ill, the way she thought about things was just hilarious. And there's still that humour to her thoughts as she does start to get ill; it's strange and odd, and you, the reader, can tell something isn't quite right, but she's still funny. But then her thoughts become uncontrollable; she goes days without sleeping, she can't switch off her thoughts, and her judgement goes out the window. She comes up with these brilliant ideas that we know aren't the wisest or the safest, and she does dangerous things and puts herself in harms way, without even realising it. It just doesn't occur to her at all that she's putting herself in danger. But the book isn't all reckless behaviour and dangerous situations. Most of the time, it's just her uncontrollable thoughts and odd behaviour. Smith does a fantastic job with Kiri's wild thoughts, and putting those thoughts - those frenzied, erratic, free falling thoughts - into words, and still managing to make them beautiful. I want to share some quotes that don't quite work out of context, but give you an idea of how her wild thoughts run. It's not just Kiri who has a mental illness. When she's trying to find Doug's house, she meets Skunk, who helps her when her bicycle tyre bursts. As the story moves forward, the two get to know each other, and a relationship develops. Skunk used to be in a band in Canada, but now he lives with his aunt since he had a Thing, as he, and later Kiri, calls it - he has a mental illness, psychosis. As the story goes on, Skunk's paranoia gets worse. And sometimes, they're relationship - which is actually really cute and adorable - becomes unhealthy. Kiri tells Skunk he doesn't need his medication, and tells him not to listen to his aunt, who wants him to take them. Skunk seems to encourage Kiri by calling her "crazy girl" as a term of endearment, and is in awe of the things Kiri says and does. It's like the two can't see each other's mental illnesses, as if their own illnesses stops seeing that there's something wrong with the other. Until they both get much worse, and realise that the other is ill... and that they might be, too. '"I freaked out," he says. "I even knew I was freaking out--I was aware--but I was so scared when I found you on Hastings Street, I couldn't control it." "Are you still freaking now?" I say. "Has it stopped? Are you better? You thought people were trying to kill me--"
"Please," Skunk says again, but I'm shaking, remembering the look on his face when he deleted his number from my phone. "Maybe you aunt's right about the medicine," I say. I feel terrible saying it, like I'm betraying him, but I'm so scared he'll slip back into that cold place again and I won't know what to do. Skunk casts me a pleading glance. "I know I messed up this time, but I can get by without the pills if I try hard enough, I really can." "If the pills help you, why does it matter?" Skunk's face boxes up. "You shouldn't have to take pills to be okay." 'When Skunk keeps waking up to find a night's worth of texts from me, he gets worried. "If you go for too long without sleeping," he says, "you may be having a Thing." "A thing like your Thing?" I admit that the possibility has crossed my mind. "Do I seem Thingy to you?" I ask him. "Are all Things bad? What if I'm having a good Thing?" Skunk considers this. "Does it feel good?" Now it's my turn to pause, a million contradictory answers crashing into each other like bumper cars. I feel great. But I'm exhausted. But I'm perfectly fine. But I'm desperate. But there's nothing wrong. But I can't seem to shut myself off. But I could stop anytime. As Kiri says, the possibility that something might be wrong has crossed her mind. It's really fascinating to me, because we get to see how wild her thoughts get, but we also get to see Kiri trying to put into words what she's experiencing and what it feels like. 'I'm not supposed to be here, I think. I'm not supposed to be here and my brain is not supposed to be doing whatever it's doing and I'm not supposed to know about Sukey and everything is wrong. But even thought she knows something's not right, when Lukas, on the behalf of his social worker mum, talks to her about how worried they are, and what his mum thinks is wrong with her, she balks at it all. Yet, at the same time, she's scared, because she doesn't know what to do. '"My mom thinks you're having a hypermanic episode." "I don't know much about it, you should really talk to her, but--"
"I'm just saying it seems like maybe you're having some issues," he says. "What?" I shriek. "But I'm fine. I'm acting totally normal." I know that flipping out will only prove Lukas right, but the thing is, I tried really hard to keep it together tonight. I've been alert and lucid, polite and serious and humble and helpful and friendly and kind. It felt like things were finally good again. Why is he wrecking it now? Lukas raises a hand as if to fend me off. "My mom's a social worker, Kiri. If she thinks you're hypermanic, you probably are." "I don't know," says Lukas. "It might have been some other word. She said you're a monomaniac." Lukas looks away. "Or something." 'I feel like I should have a top hat and a monocle. A monocle for the monomaniac. A monocle and a motorcycle. I would go monocling around Stanley Park in the dark most monomaniacally. Where's a good top hat when you need one? I don't want to say too much more, Wild Awake is really a story that should be discovered as it's read. 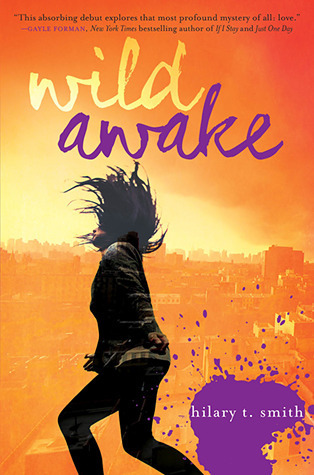 But Wild Awake is an incredible, emotional and moving novel of heartbreak, grief, and Kiri's spiral into mental illness, and discovering that she might need help. It's wonderfully written; raw, intense, evocative, and completely captivating. This is simply an amazing story, and I'm really looking forward to reading Smith's other novels.